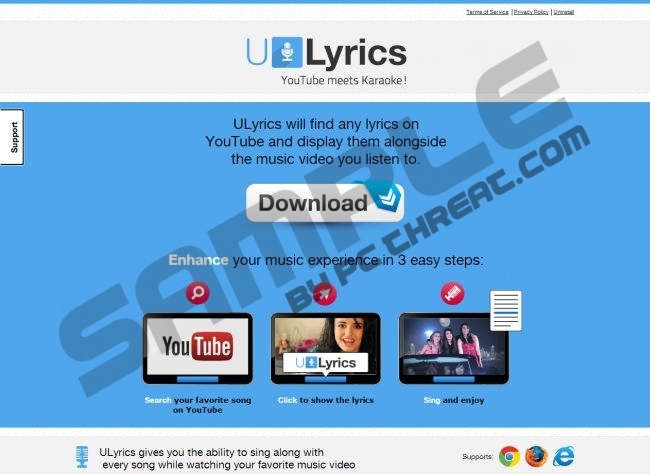 ULyrics is yet another Lyrics family plugin which is meant to provide you with lyrics to songs you listen to on YouTube. Unfortunately, the program is not reliable, and so you should not trust its services. You should be particularly cautious about the application if it gets installed onto your PC illegally. This is highly possible since the official download page ulyrics.co no longer provides an active installer. The same has been discovered when analyzing LyricsGet, Lyrics Say, LyricsBuddy, LyricsViewer, and tens of other add-ons which belong to the Lyrics family. Unfortunately, these applications have not been designed to present lyrics. In reality, their only purpose is to track your virtual activity and use it to display various advertisements. These can be both annoying and dangerous, which is why instead of ignoring the real problem, you should delete ULyrics from the Windows operating system. Have you discovered Ads by ULyrics? These advertisements may use the name of the plugin installed onto your web browsers (IE, Firefox and Chrome); however, in reality these offers are managed by third parties. Many browser applications use the services of third parties and support their advertisements; however, not all can be trusted. Do you know what third parties are linked to ULyrics? Do you know how they can track your virtual activity, or how they act on your browsers? If you do not, there is no doubt that trusting the plugin may be quite dangerous. Needless to say, ignoring the extension is not how you should deal with it because active cookies could continue spying on you. Furthermore, it is most likely that you would not be able to run your browsers freely unless you deleted the application because it has been discovered that it may decrease connection speeds dramatically. There is no reason why you should keep ULyrics running on the browsers, and so now you need to decide how you wish to get rid of this application. Some computer users decide to remove the program manually. Needless to say, this option requires a bit more knowledge and experience because even if you delete ULyrics using the guides below successfully, it is possible that you will need to deal with other undesirable programs as well. What should you do if you do not know how to locate and delete these potentially existing threats? Install automatic malware removal software which could guarantee further protection as well. Double-click Add or Remove Programs, select the undesirable one and click Remove. Open the Start menu (left of the Task Bar), click Control Panel and then Uninstall a program. Right-click the application you wish to remove from the operating system and select Uninstall. Right-click on the Metro UI menu top open a pane below, select All apps and click Control Panel. Move to Uninstall a program and right-click the application you wish to remove. Click Uninstall. Quick & tested solution for ULyrics removal.